I’ve used the Meike 6.5mm circular fisheye on my Sony a6000 for surf photos and for some test shots which helped me compare it to the Samyang/Rokinon 8mm f2.8 fisheye. The video shows you my unboxing and some results of my first session and test shots. I ordered my Meike 6.5mm circular fisheye in Sony e-mount from Amazon.co.uk for £125.99 (currently not available), it took 12 days to arrive from China and I didn’t have to pay any extra duty or taxes. You can buy them from Amazon.com for $149.99 (the price has now risen to $449.99!) and I expect the shipping time would be very similar, I can’t say about the duties and taxes though. There’s a few types of fisheye lens, I’ll give you a quick run down of the options you have and what’s most popular for surf photography. I’m going to talk about my Sony a6000, it’s a Sony e-mount camera with an APSC sized sensor, you can apply this info to any other sensor or film size. Diagonal fisheye – the image circle completely covers the sensor, the widest angle of view is from top corner to bottom corner. 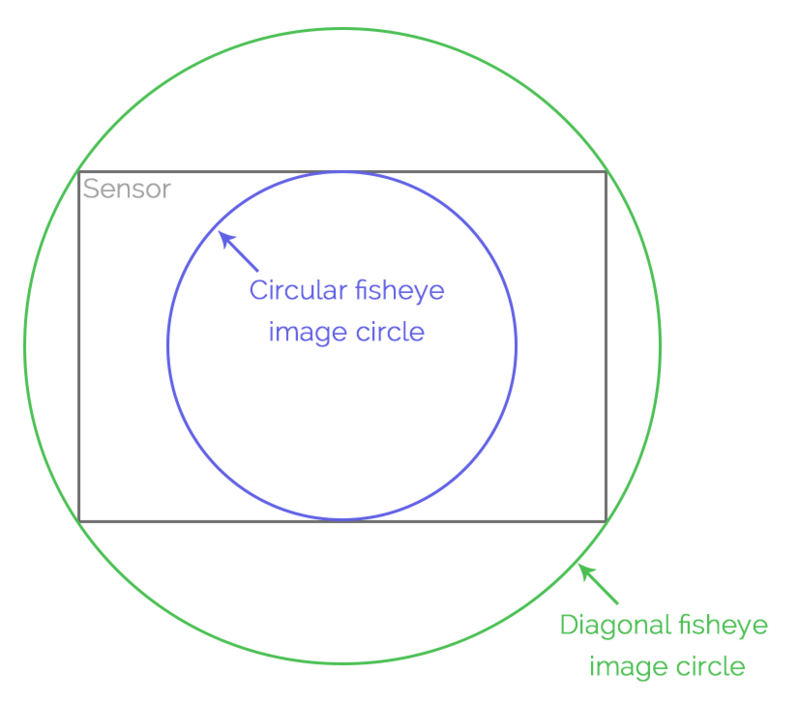 Circular fisheye – the image circle fits inside the sensor, creating a circular image which includes the widest field of view from edge to edge in all directions. Traditionally a diagonal fisheye is most popular for surf photography. It gives you a wide, distorted image with no black borders, you can print it as it comes out of the camera. I love the Samyang 8mm fisheye, there are several housings with dome ports designed for it and it has great image quality. So why would you use a circular fisheye? It’s different… I’ve said before that I try to only buy new kit that allows me to take photos that I can’t take with my current gear. This is one of those lenses. The circular image is unique, you can’t get it with a GoPro, which is a pretty decent way of distinguishing you from lots of other people on Instagram. 2: This particular fisheye is really good value, half the price of the Samyang 8mm! So if you’re really on a tight budget it’s a great option. 3: 190 degrees is wider than any other fisheye I’ve shot with, and any other circular fisheye for the Sony e mount, and you get that top to bottom as well as side to side, you can see behind you. 4: With some fairly simple processing you can make your images look very similar to a diagonal fisheye. Obviously you sacrifice resolution, but as I mentioned in my post on long telephoto lenses, that’s not an issue for most surf photographers, including me. 5: Because it’s a circular image you can rotate it to make sure the horizon is level. You can rotate and then process the images so you can get a levelled photo however you were holding the camera. 6: Photo spheres, they’re part of the future of photography and a lens like this will let you take them quicker than any other. I might go into more detail on this subject in the future, but I don’t want to delay getting this post up. Here’s my simple Lightroom preset that turns a shot from the Meike 6.5mm circular fisheye into a close approximation of the same shot taken on the Samyang 8mm fisheye. To get this effect I used the built in lens corrections for the Sigma 4.5mm circular fisheye (about $900, available in various lens mounts), then changed the distortion slider to 72. That gives me a quick and easy correction that gets me pretty close to the field of view of the Samyang 8mm fisheye. There’s a great piece of free software called Hugin that gives you lots more control over editing this type of photo. Using Hugin is outside the scope of this post but I recommend checking it out if you have a circular fisheye and you want to experiment with different ways of getting a more traditional looking image out of it. 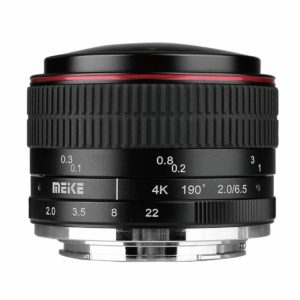 Should I buy the Meike 6.5mm circular fisheye for surf photography? For Sony a6000 users specifically I’d probably recommend the Samyang 8mm over the Meike for your first fisheye. It’s got better image quality and the photos coming out of your camera will be in a much more familiar format than the circular ones coming out of the Meike. If you already have a diagonal fisheye, or if you really want to try something different, then the Meike 6.5mm circular fisheye will definitely offer something new. You will want to get a housing and port that works with it, I use the Liquid Eye C6000 for my Sony a6000. You can create images that are impossible with nearly any other lens using the Meike 6.5mm circular fisheye, and the fact that it’s so much cheaper than any circular fisheye available in the same formats is a great reason to try it out. I’m looking forward to using it more and working with the circular images that come out of it. Just finding the best composition is going to be interesting too. For the sony A6000/6300, have you tried the Sony 16mm 2.8 + Fisheye adapter ? I haven’t tried the 16mm + fisheye adapter combo, I went straight for the Samyang 8mm fisheye for my a6000 and never had a need for another diagonal fisheye. A few people have mentioned using it for surf photography, and there’s at least one advantage of having auto focus available. If I can get a good deal on the lens and converter I might pick one up at some point to try out. A bunch of photographers are shooting with Salty housings and the 16mm+fisheye adapter, including Chris Burkard. He gets excellent results and says he prefers it over the Samyang/Rokiono because of the autofocus. Yep, just found this out on Chris Burkard’s FAQ page. I currently have the Canon 7D (Mk1) + the excellent Sigma 8mm fisheye. But the housings are so expensive for big DSLRs that I consider switching to Sony. Can you do 360×180 with two Sony mirrorless with that lens? What do you think? I think you could, with the right set up. The stitching could be tricky but I’m sure the right software would cover it. You’d have issues with objects very close to the lens, because there would be a bigger distance between the sensors than there is with something like the Ricoh Theta S camera. Obviously if you just wanted to shoot a static scene it would be easy with one camera and lens, but for an action surf shot you’d need a custom housing to get the cameras as close together as possible, so that’s another pretty big barrier too. I should probably do a test with my C6000, take a shot facing one way and put the housing in the closest position possible and take the opposite angle and see if it would stitch. That would give us a reasonable idea if it’s possible with off the shelf cameras and housings. Might try this weekend if I get a chance. this lens looks small….would it fit in the Meikon housing? I discuss this at 25:17 in the video above with an example of a photo taken inside the Meikon. It does fit inside, but you lose most of the image because the port obscures the edges. You need a dome port for any fisheye and for an extreme circular fisheye it’s even more important. HI Ben! Thanks for the videos and information you share. Great job. I think about buying the Liquideye c6300 and I wonder which dome I should get. As I am not a fan of fisheye lenses my choice would be the SEL1018. You mentioned in a video that you would rather use a flat port for a wideangle lens, but I guess it is super difficult to take over/under shots with such a setup? So the only way to go for over/under shots is a fisheye plus a dome? Is it also possible to get over/under shots with the 4″ instead of the much bigger 6″? If you’re going for over/under shots in particular I’d get the biggest dome you can. See if the 10-18mm does what you need and if not, look into a fisheye (the Samyang 8mm is probably your best option). You can get over/under shots with the 4″ dome but it’s harder than the bigger one, especially to get both over and under in focus. I don’t know which port would work best for the 10-18mm for general above water photos as I don’t have that lens myself, so I’d ask Liquid Eye themselves to double check. Hi, I bought Meike 6.5mm f2.0(E-Mount) 3Nos. of lenses but the lens is not focusing well, even-though no focusing @ infinite or barrel end. The MFT version is Awesome. Hi, that sounds very strange. My e-mount version of the Meike 6.5mm f2 has no issues focusing. What settings are you using? I can try and re-create the issue. If it’s performing very differently from the MFT version with the same settings then it suggests it might be a faulty lens (or batch of lenses), but there could be a few reasons it’s not performing as expected. I mostly use mine at f8 or f4 with the focus set at 1m for above water photos and get very good focus. For underwater I use f8 and set the focus to as close as possible and get pretty good results too (when the water is clear enough). Thanks for the reply, I returned the lenses to the vendor, you are correct it might be faulty lenses, its didn’t have any distance scale instead of distance scale near, far & infinite.